Billy Martin has an obsession with percussion, and his Amulet records was founded to document that love. In this instance, the Medeski, Martin and Wood drummer's focus is on the insrument used by Amazon Indians for magic and ritual. 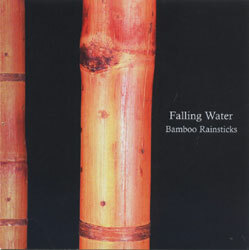 �The rainstick is a long tube made from a dried bamboo or cactus branch. �When dried, the tiny seeds inside loosen and flow in a chattering way when the tube is tilted, making a sound very much like a delicate flow of rain. �This album is a collection of eight recordings Martin made of his own rainsticks, which were combined by David Baker to form one continuous track. Martin writes in the liner notes that he listens to his rainsticks when traveling or when in need of solitude. �He suggests that the listener not play the disc at loud levels so as to properly enjoy the gentle effect of the sound. �This doesn't make for a particularly interesting listen, but that's not the purpose of the release. �If you feel that your personal sonic environment would benefit from these flowing sounds, if your garden or tea room is wanting for accompaniment, if you're looking for well-recorded rainstick samples, or if your nerves are on edge and require soothing, then this album may be for you.